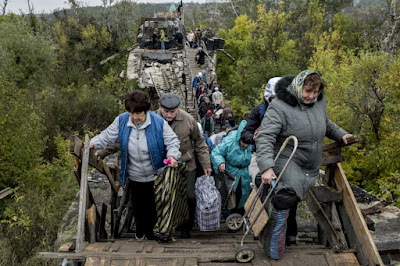 STANYTSIA LUHANSKA, Ukraine -- Every two months, wheelchair-bound pensioner Mykola Ivanovych needs help to cross the damaged bridge over the Siverskiy Donets River into government-controlled territory so that he can get his government pension. People who live in the conflict-torn Donbas region of eastern Ukraine cross a damaged bridge into government-controlled territory so that they can receive their pension. The dividing line lies between his family home in non-government-controlled Luhansk and the government-controlled Stanytsia Luhanska. Mykola Ivanovych, who worked as a bus driver for 54 years, must present himself at the state-run bank in Stanytsia Luhanska, which checks his identity to allow him to receive his monthly payment of USD$53. Inside the bank, he waits patiently while his wife joins the queue to carry out the verification process. Mykola Ivanovych, who is his 70s, suffered two strokes after his son was killed by an artillery shell in 2014 – the first year of the Ukraine conflict, which has cost over 10,000 lives. For hundreds of thousands of elderly and disabled people in the conflict-torn Donbass region of eastern Ukraine, the state pension is their only means of support. However, some 160,000 retired people lost this income after the government limited access to state pensions for residents of the area outside its control in December 2014. Further restrictive measures introduced last year led to an additional 400,000 people losing access to their pensions. Currently, people living in non-government controlled areas are required to register as internally displaced persons with the Ukrainian authorities in order to continue to access their rightful pension benefits. “Payment of pensions should be resumed to all retired people, regardless of their place of residence, whether they are registered as IDPs (internally displaced persons) or reside at their homes,” said Pablo Mateu, UNHCR representative in Ukraine. Olena Grekova, head of the Severodonetsk-based office of Right to Protection, a UNHCR partner NGO that helps internally displaced persons in Ukraine, said many bedridden people had received no pension payments since the start of the conflict because they were unable to travel to government offices for identification. Some have lost their payments because of mistakes. Tetiana Kovalenko, 83, had to leave the city of Donetsk after her house was bombed. Since 2015, she has lived in government-controlled Myrnograd and is registered as an internally displaced person. Kovalenko, a former mine worker, stopped receiving her pension of USD$73 per month in April after the social security service decided that she lives in non-government-controlled territory. Another woman, Olga Burkalo, 38, who has suffered from a severe form of diabetes since the age of 11, has up to 10 injections of insulin daily and needs her pension of USD$50 per month to pay for her treatment. Social security inspectors visited her in December and March to check if she lives at her address in government-controlled Selidove. In February, she underwent an identification process at a bank. However, in April she stopped receiving her pension. She was mistakenly suspected of living in non-government controlled territory when, in fact, she had not been there for more than a year. Burkalo, who trained as a biology teacher, is now too weak to work. “I used to work, I paid taxes,” she said.